Buildings are not only one of the largest contributors to climate change, with 19% of global greenhouse gas emissions used for operations, but they also carry a large potential for climate change mitigation – with potential of 50-90% of energy savings in existing and new buildings, without reducing occupant comfort. A building element that strongly influences both building energy efficiency and occupant comfort is the building facade. 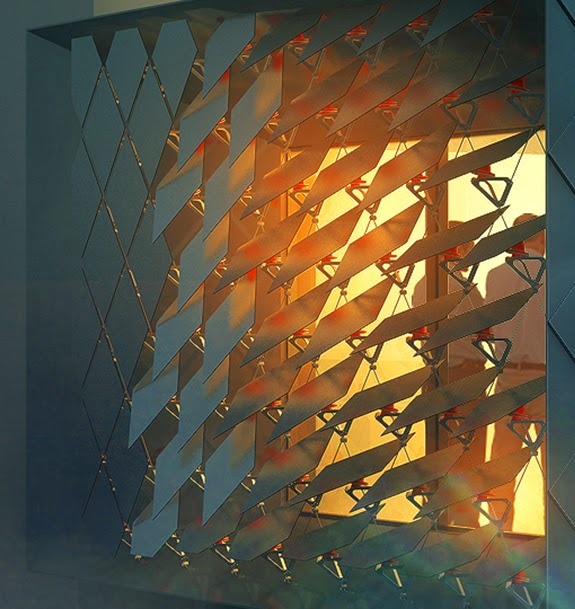 An high-performance building envelope, a so called Adaptive Solar Façade, is being developed at the Chair of architecture and building systems. The Adaptive Solar Facade is a lightweight, automatically controlled, modular building shading system with integrated photovoltaics. Due to its modular structure, where every facade module is independently rotated using soft pneumatic actuators in 2 degrees of freedom (DOF), it offers a very fine regulation of energy flows from and into the climatized indoor environment, thus creating a potential for heating/cooling energy savings. On the other hand, the modular structure of the façade allows a fine modulation of daylighting levels, aw well as many ways to block or allow views, thus having a strong influence on occupants’ comfort. Furthermore, integrated photovoltaics provide an additional potential for improvement of the net energy balance of the building with the Adaptive Solar Façade. This project is a joint effort of several researchers at A/S. In this talk I will present my research proposal, which will elaborate on three innovations concerning the actuation and control of the Adaptive Solar Façade. During this research, facade prototypes are going to be implemented in two real-world projects, serving as living labs: at the ETH House of Natural Resources (http://www.honr.ethz.ch/), at the ETH Hönggerberg Campus, and as a part of the NEST HiLo unit – an ultra-lightweight and super-integrated guesthouse at EMPA in Dübendorf (http://hilo.arch.ethz.ch/).